TJ Electrical were instructed as the electrical contractor in Tooting to design and install all mains electrics, power, telephone, data and satellite cabling to a new apartment block comprising six modern units. A developer building a new apartment block comprising six modern units required an electrical contractor in Tooting to fully design and install all of the newbuild commercial electrics in Tooting at the site. 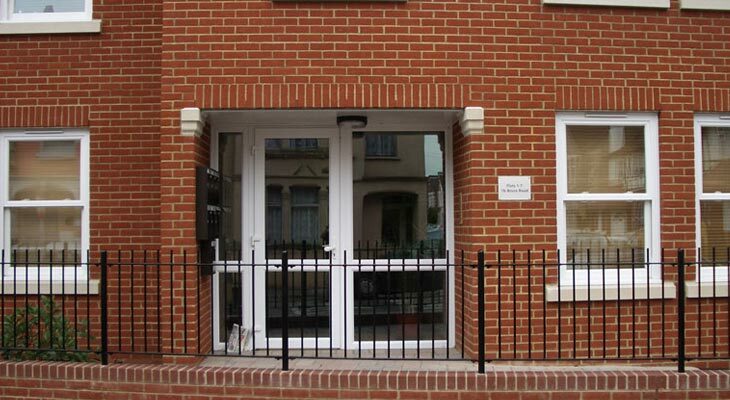 TJ Electrical were instructed as the electrical contractor in Tooting to carry out the works, which included the design and installation of all mains electrics, power, telephone, data and satellite cabling, as well as door entry systems. As with any newbuild electrical contractor job, we spent several short periods of time working at the site, in and around the other trades, sometimes utilizing a team of two of our commercial electricians and at other times a team of four. Overall this Tooting electrical contractor job lasted four months. If you require an electrical contractor in Tooting or any where else across London or the south east then please don’t hesitate to contact us at TJ Electrical contractors in Croydon. We are here to help. 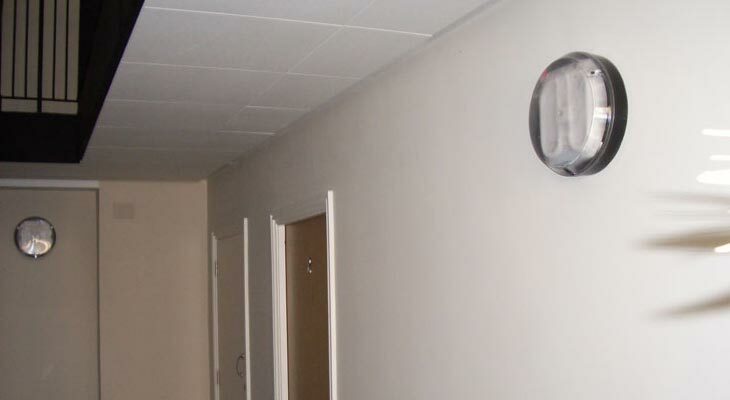 Our electricians installed long lasting energy efficient lighting in the communal area (some of them being emergency lights). The energy efficient lighting was control by time lag switches which turned on all of the communal lights for a set period of time. 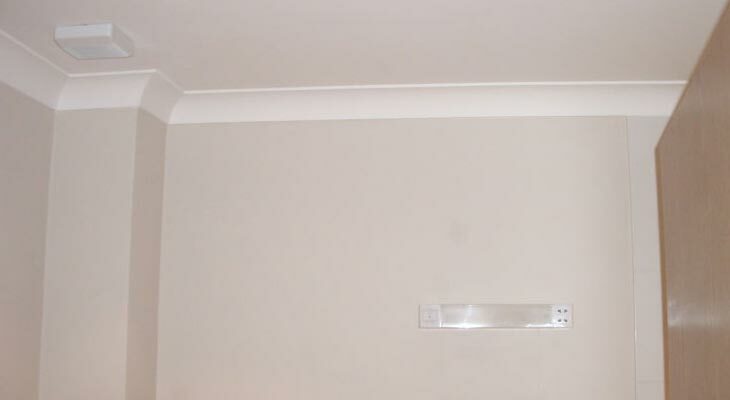 With this Tooting electrical contractor job being carried out before the 17th edition IEE regulation changes, we installed 16th edition Crabtree distribution boards in each flat. 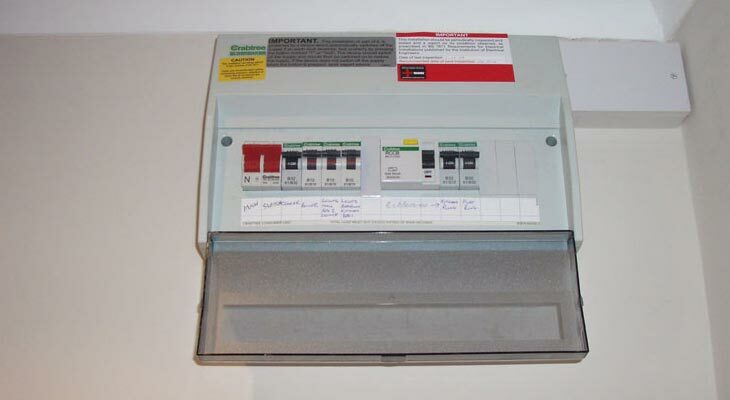 As Croydon electrical contractors we tend to use Crabtree or MK distribution boards, both highly regarded. 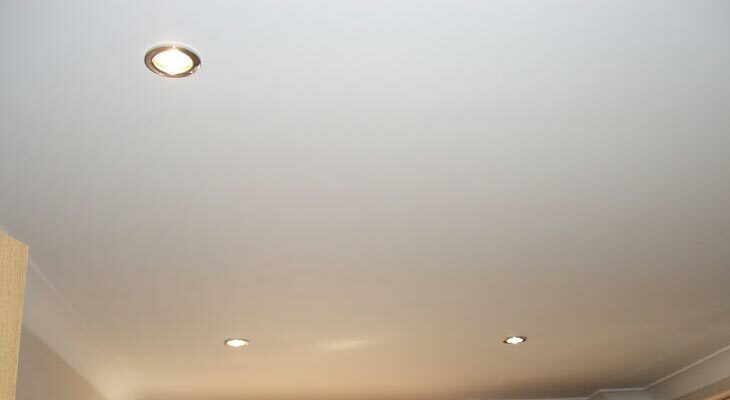 In the kitchen we installed recessed 50 watt halogen spotlights from JCC Lighting. Nowadays as an electrical contractor we tend to install LEDs and compact energy efficient lighting. They use far less electricity than the heat emitting halogens, saving lots of money in the long run. This photo shows the Tooting electrics installed in the bathroom, including recessed spotlights, shaver light and a Vent-Axia extractor fan. Because of the low draw on the electricity all of the bathroom electrics inside the apartments ran on the same electrical circuit. The kitchens ran on their own circuits due to the amount of electricity that they draw. 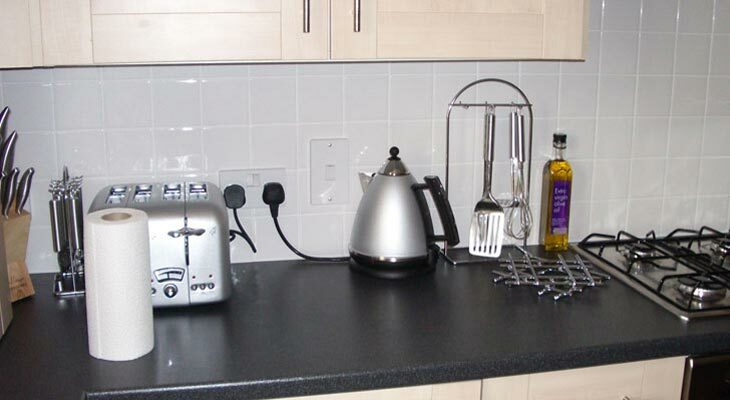 This picture shows the cooker isolation switch with sockets installed alongside (plus under cupboard lighting which is out of view). If you require Tooting electrical contractors then get in touch. 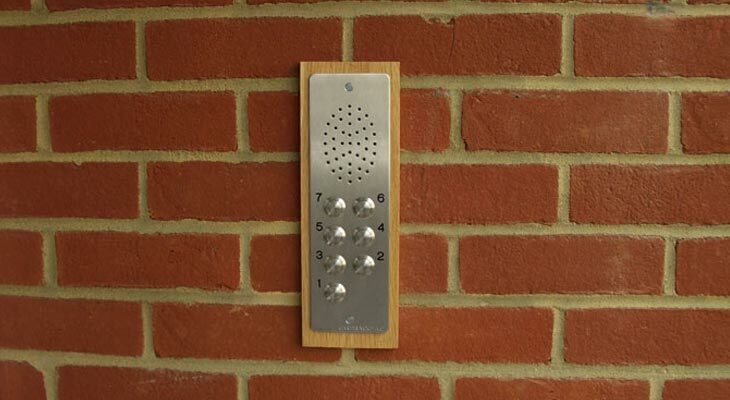 We ran standard low voltage cabling from the external keypad up through the building riser to audio intercoms inside each flat. The riser acts as a central cable management system for running the three phase electrics from the service head up via ryefield distribution to the apartments. As the electrical contractor in Tooting for this new build apartment building, TJ Electrical in Croydon planned, designed, supplied all materials and installed all of the electrics and trunking / cable management systems, including sub mains, power, telephone, aerial and intercom. We ran power from the landlord’s distribution board to these external bollards via regulation buried steel wired armoured cable. 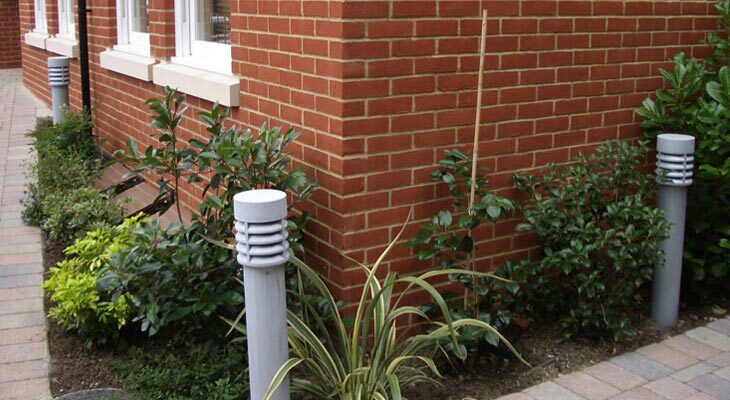 The bollards emit low level energy efficient lighting around the building at night and are controlled by a dusk to dawn sensor driven time clock. 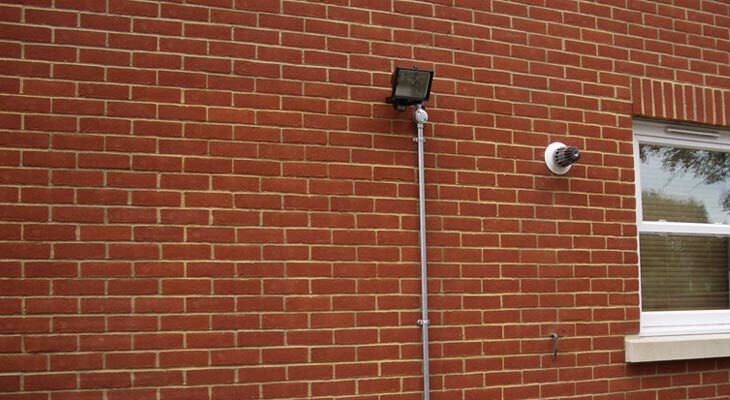 This is an automatic sensor driven 100 watt security flood light that our Tooting electricians installed on the outside side wall of the building, overlooking a bike rack and bin shed. The electrical wiring to power the lights is housed within the galvanised steel conduit.